Membership in Beta Alpha Psi recognizes academic excellence and complements members’ formal education by providing interaction among students, faculty, and professionals. Since the value of membership in Beta Alpha Psi is based on a member’s participation in the Fraternity, pledges and members of Beta Alpha Psi should be active participants in the activities of the organization. have attained a cumulative grade average in their graduate courses of at least 3.0 (where A is equal to 4.0) or the equivalent. Full-time members of the accounting, finance, or information systems faculty at institutions in which a chapter is located are eligible for election as Faculty members. 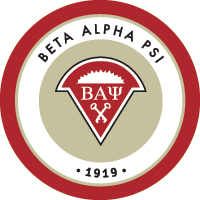 Persons exhibiting those qualities that Beta Alpha Psi fosters and who have achieved prominence in the fields of accounting, finance, or information systems or have contributed significantly of their time and talent to the fraternity or its local chapters are eligible for election as Honorary members. In order to fully benefit from Beta Alpha Psi (BAP) activities, students seeking to be BAP candidates must declare their candidacy when they have at least the equivalent of one academic year (two semesters) remaining prior to graduation. A student may remain a candidate for no more than one semester or two academic quarters following completion of required major courses prior to induction as a full member; exceptions for special circumstances may be made only with approval of the chapter’s faculty advisor. DEADLINE FOR SPRING APPLICATIONS HAS PASSED, PLEASE CHECK BACK FOR FALL APPLICATION INFORMATION! Undergraduate student members of the fraternity shall remain student members so long as they remain degree seeking undergraduate students. Graduate students and Post-baccalaureate students at the institution where they were members as undergraduates may elect to continue or renew affiliation. Pledges shall remain pledges until the first semester of association with Beta Alpha Psi after they have completed one and half years of collegiate courses and at least one upper level course in accounting, finance, or information systems beyond the business core. At that point they must have satisfied all the requirements for membership and be initiated or be dropped as a Pledge. Student members of the fraternity who relocate at another institution, either to complete their undergraduate program or to pursue a graduate degree, may become members of the local chapter provided they: (1) apply for membership and (2) meet all membership requirements for the local chapter. Pledges who relocate to another institution to complete their undergraduate program may become Pledges of the local chapter provided they apply to the local chapter and meet the requirements of the local chapter.